35 years old :-) Mother to Zebulon born 26/8 -2016 Married to Mattias. 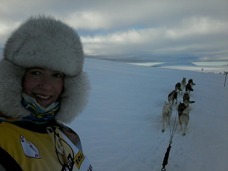 I have compeeted with sleddogs for more than 20 years. Siberian Huskys, German shorthaired pointer, Euro hounds and Alaskan Huskys. At the moment I have only pure breed Siberian Huskies. My proffession is author, writer and dairy farmer and I have togheter with my husband ~45 cows +heiffers. I live in Orsa "center of Sweden"... 300km to three "capital" cities. Östersund, Stockholm and Oslo! Orsa is close to Mora (Vasaloppet. 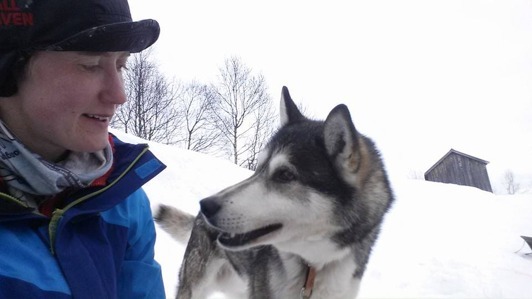 Wasalauf) so it´s really a good area for outdoorsports, skiing and dogsledding. If you want to follow on a trip with the dogs. Contact me! We have a cottage at Koppången where we can start the sledge tour. I litterally grew up in the dogyard and started my own kennel-bloodline in 2000. Starting from my fathers succsessful dogs. The whole family compeeted with the dogs in mostly pulka style but offcourse also with sled! We have always trained and compeeted with our dogs in all kinds of styles and distances. Multipurpose dogs. 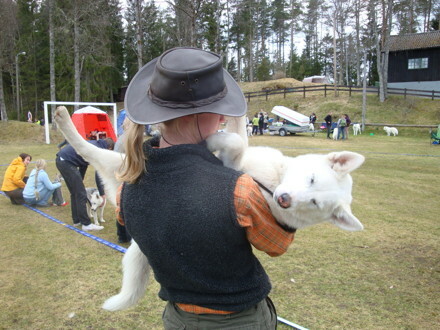 We prefer longer distances and all the foundationdogs of the kennel compeeted at Femundlöpet 500km 1994. Fantastic female Disa as leaddog. Today it´s the fifth generation thats runs in lead, leading my team to victory. Me and my deeply beloved SE(polar)Ch SEUCh Ylajärvis Vargtass. He is been my most valuable dog for years. Picture taken after Norway Trail 2015. Has inherit his fathers great leadership, his mothers speed and grace. Excellent build overall and has led the team at all races the last years. Sprint, middistance and longdistance. Very friendly and easygoing dog. Eyes and goniskopi clear. Hips A/C wil be xrayed again. 2*CAC. Eyes, Hips, Elbow checked clear. Big and strong. Loves to be cuddled and is a special charachter... Extreamly "morningtired" and his the best dog to calm down and rest at checkpoint. Can sleep anywhere. Long legged, fast and nice movements. Truly an longdsitance trotter! A bit bossy towards teammembers so mostly runs alone in team. Often in point.